The DoD Child Development Virtual Lab School (VLS) is a dynamic, growing resource. As such, we are pleased to report that the VLS Foundational Course on Healthy Environments recently implemented a full 42-lesson update (seven lessons across six individual tracks). We reviewed the latest relevant research, national standards and guidelines, and made updates to the Learn content, Explore and Apply activities and resources, Demonstrate questions, the References & Resources, and even the course video. All narrative content changes are now available; however, video updates will load to the site on a metered basis, starting with the Infant & Toddler track. As a reminder, the Healthy Environments Course includes topics such as the creation and maintenance of healthy environments, proper hygiene, diapering and toileting, disease prevention, daily health checks, emotional wellness, physical health, proper nutrition, and special health needs. We have conducted a similar full-scale review of the Safe Environments Course, reviewing each lesson across all six tracks. These narrative and video updates will appear on the site over the next couple of months. Competency Reflections (formerly called the Competency Checklist) have been redesigned so that a staff member or provider and their trainer can each indicate their individual ratings for measures of growth in specific competencies, enabling a two-way dialog that fosters reflection, improvement, and mastery. These tools now include a space to identify strengths, and establish goals and follow-up plans. 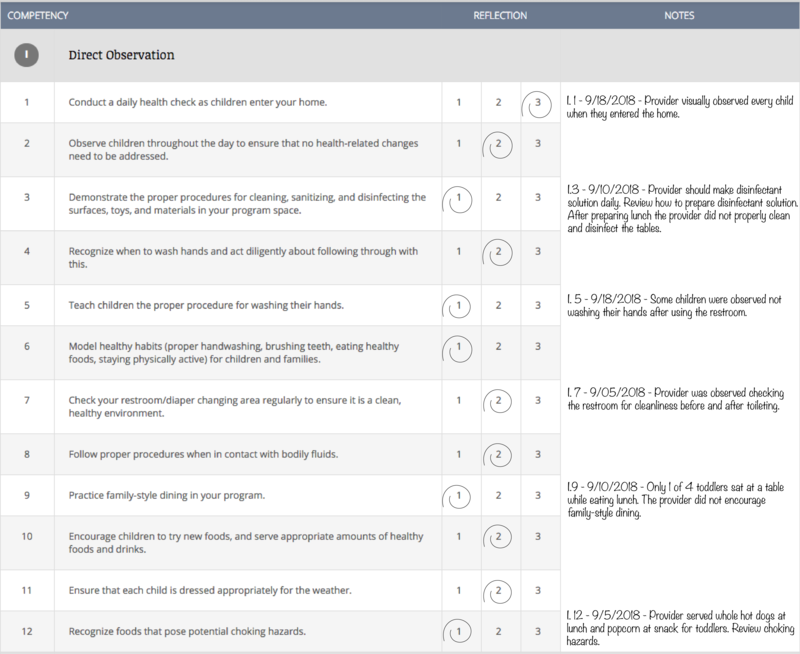 The Competency Checklists were previously available in each course’s first lesson; you will now find the Competency Reflections on their respective course page and in the Course Guide. You can also still find the Competency Reflection on a user's Progress Details in the dashboard. The new Course Guide (formerly called the Trainer’s Guide) dynamically lists the Learn, Explore, and Apply resources and activities across a course, so that new and updated activities are automatically integrated within this tool. The Course Guide is also robust; using a simple toggle on/toggle off function, you can choose to list all activities in a course, or only a course’s required activities, giving you the freedom to streamline your workflow. We now offer a Course Guide for every VLS Course. These Course Guides also replace the previous zip files, offering a centralized location from which to access and print all of the current resources and activities provided across all course lessons. Course Guides can be accessed by everyone from the respective course page. The End of Course Assessments (EOCAs) have been changed from PDF format to HTML webpages. Training & Curriculum Specialists (TC) or Program Managers (PM) can easily toggle to see the suggested responses and print the blank assessment for their staff. The EOCAs are still only available behind the VLS login to TC and PM users, or those with higher administrative privileges (e.g., Installation Administrators) and can be accessed on a respective course page, in the respective Course Guide, or from a user's Progress Details in the dashboard. Various visual and layout changes have also been implemented. These changes support the functionality of the new and updated Program Tools and facilitate easier navigation. In addition, these design and technical changes provide a more responsive layout that better adapts to any device or screen-size. With these changes, you may experience some oddities in display which are caused by your device browser cache. One example would be finding odd rectangular symbols where an icon or picture should appear. To fix this, try using your browser's forced-refresh or clear-cache feature. For desktop users, holding shift and clicking the browser's refresh button should clear the cache. For other devices, find the clear-cache feature in the browser's menu or settings. Many of the updates to these tools are the result of rich user feedback provided over the past year. Our heartfelt thanks to all those who offer suggestions on ways to make the VLS even better. The information we gather at the VLS trainings, during conversations with DoD’s Office of Military Family Readiness and Service Headquarters staff, and from VLS support requests, impacts what we do. This information is critical to the continuous improvement of the VLS, so please keep your suggestions coming! Consider how this information may affect what you do within your child and youth programs, and when and how can you help families get the child development and parenting knowledge they are seeking.